[W]e determined that the DEA could verify only 44 of the 100 seizures we sampled as having advanced or having been related to criminal investigations. 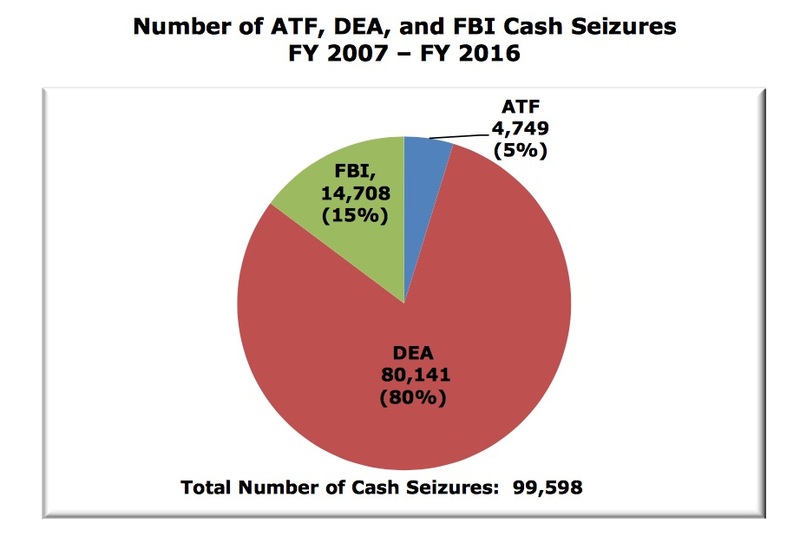 This means that in over half the cases there was no discernible connection between the seizure and the advancement of law enforcement efforts. These aren’t drug seizures we’re talking about, but cash and other assets taken from people who are suspected of criminal activity. Not convicted, suspected. Are some of those people actually criminals? Sure! Are they all criminals? Nope. This concerns some people, “this” meaning the practice of government officials or agencies taking someone’s property—and often keeping it—without ever proving that person has done something wrong. How often does that happen? Well, nobody knows for sure. Why is that? Well, one problem, according to the report by DOJ’s Inspector General, is that DOJ “does not measure how its asset seizure and forfeiture activities advance criminal investigations.” Huh. Doesn’t it seem like that’s something it ought to do? Keep track of how often it actually had a legitimate reason to take someone’s stuff? Well, it doesn’t. This, the report opines, “risks creating the impression that … law enforcement officers prioritize generating forfeiture revenue over dismantling criminal organizations.” Yes there is indeed that risk. Especially because there is a lot of money being taken this way—according to the report, well over $5 billion between 2007 and 2016. Since there is no official data, the IG’s office looked at a sample of 100 cash seizures by the DEA, which did about 80 percent of the seizing during the relevant time period. The sample wasn’t totally random, but was chosen from cases that the IG believed met two criteria making them “particularly susceptible to civil liberties concerns”: (1) the officer didn’t have a warrant, meaning he or she was (at best) applying his or her own understanding of the Fourth Amendment; and (2) the circumstances “seemed to indicate the absence of illicit narcotics,” which I guess means there were no drugs and so no direct evidence the person actually was a drug dealer or drug-money courier. In other words, the IG was asking whether, in those cases, does the evidence seem to show there really is a reason for concern? The answer: yes, if you think that law enforcement should get this right, or at least be able to verify that it got it right, more than 44 percent of the time. Because the DEA could not do that. In fact, of seizures that took place during “interdiction” operations—it profiled stopped people while traveling—it could verify that doing so had “advanced or related to a criminal investigation” only 34 percent of the time. Local law enforcement seizes stuff too, and its record is also dismal and often flat-out crooked. The report mentions one incident in Florida where a police task force conducted a money-laundering investigation that resulted in 84 arrests and the seizure of $49 million, of which the police department was allowed to keep more than $6 million. How many indictments resulted? You in the back yelling “zero” shut up, you’re ruining it, but yes, zero. Not one. “Such outcomes,” the report tentatively suggests, “can raise questions about whether seizures are intended to serve legitimate law enforcement interests or to bolster law enforcement budgets.” Yes indeed they can. The report offers a variety of recommendations for improving matters, but can’t quite pull the trigger on the easy and obvious answer: don’t let law enforcement officers or agencies keep any of the money. Ever.